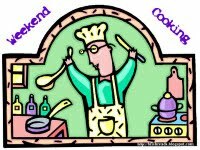 Weekend Cooking is hosted each week by Beth Fish Reads. It is a fun meme that provides great new recipes, cookbooks, and other foodie finds. Follow the link to discover the new posts for this week. Well, summer has arrived in the Midwest with a vengeance. The weather forecast for the next seven days sounds like a broken record: excessive heat warnings with temperatures in the 90s and heat indexes hovering around 105 degrees! It is the kind of weather that zaps the energy out of everyone. Fortunately, I have central air conditioning and lots of books to help me through this difficult weather pattern. While it is too hot to even think about cooking, I do often select one weekend day to grill chicken and steak on the barbie (well, I don’t actually do the grilling…I delegate that responsibility to my hubby) and I always plan for extras to have on hand for salads for the rest of the week. I currently have chicken breasts marinating in the refrigerator, and I will head out later today to purchase some steaks that happen to be on sale (the only time we ever eat steak, really, is when it is on sale). We will also have corn on the cob, homemade ice cream (again – I just LOVE the stuff), and possibly Coke Cake. I mentioned this family favorite a few weeks ago and there was some interest in the recipe, so I thought I would feature that today. I really don’t know the origins of this dessert, I just know that my mom has made it ever since I was little and it has remained a favorite for nearly five decades. Some say that it is reminiscent of a Texas sheet cake, although I have not tried one of those to make the comparison. Now this cake is loaded – I mean loaded – with sugar, so it is guaranteed to appease any sweet tooth you may have. The high levels of sugar, coupled with the three sticks of butter, makes this a rich, decadent cake where a small piece can really go a long way. However….somehow the cake never seems to last more than a couple of days around our household. While the cake is fabulously rich, moist, and deletable on its own – you can really kick it up a notch and serve it warm with a scoop of homemade vanilla ice cream melting over the top. Now that is heaven on a plate! In a large saucepan, add the butter, cocoa, marshmallow fluff, and coke. Bring to a boil and set aside to cool slightly. In a large bowl, add the sugar and flour and toss together. Pour the warm mixture over the dry ingredients and blend together. Once cake is taken from the oven…..immediately prepare the icing. In a saucepan, bring 1/2 cup butter, 3 tablespoons cocoa, and 6 tablespoons Coke to a boil. Boil for one minute and remove saucepan from burner. Add a box of powdered sugar and mix until smooth. Pour icing over hot cake and let cool. I always think of this as a southern thing. not sure if that is true, but I have never seen one in NJ. I've never heard of this! I don't even know what it would look like–I'll have to google it. Maybe I'll make it and give it a go. Thanks! This is a really, really good cake and I'm not much of a cake lover. The icing sort of seeps down into the cake, just a little. Yum. I've had another sheet cake version that is similar that has cinnamon in the icing along with the cocoa. Heaven. It does sound decadent! Loads of sugar and calories. How can you go wrong? That does sound sweet! I'm sure this would be a big hit in the South – I'm not familiar with it though. I just may have to try it. This is seriously sweet (marshmallows, sugar and coke!!). Must be a southern thing because it's unheard of around here. Still, anything to beat the heat, right? Stay cool! Wow! I could feel my sugar count rising reading the recipe! lol it does sound really delicious and really decadent and sooo sweet. I think I'm afraid to make it! lol but certainly it's one I'll keep to make one day when it's cooler. Like you we are too hot to bake right now. Stay cool and read lots, Molly! Wow! That is some sweet cake. I would probably have to modify it a little so it wouldn't be quite so sweet. I think that a tiny bit would go a long way. That does look sweet…cocoa, marshmellows, cook, sugar!! Good one Molly!! Happy doodling! OH my husband would LOVE this! I've had versions of cake made with coke before but never with the marshmellow. Yummy! I too have had and baked Coke Cake before but never with the marshmallow cream. Yum. It is so rich and is always a hit at pot lucks and picnics. I know what you mean about being too hot to cook. I've heard of it, but never actually tasted this cake.